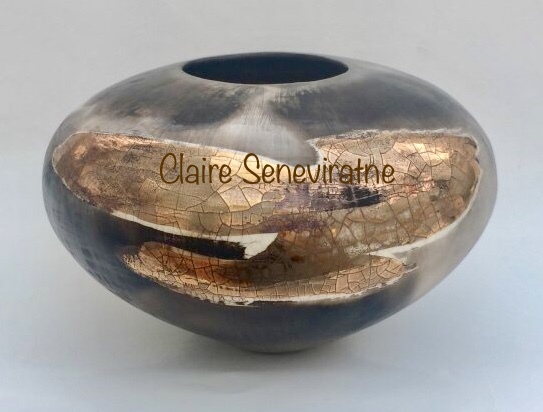 Claire Seneviratne - Ceramic Artist: Large round porcelain pot with gold lustre. Large round porcelain pot with gold lustre. This large pot has been burnished to create a smooth shiny surface which is particularly suitable for smoke firing. It has then been partially glazed and fired in my electric kiln. After a gold lustre has been fired onto the glaze it has then been smoke fired in sawdust. If you would like to see this pot in more detail I have a video of it in my blog/vlog section which is situated on the home page at the top right hand side. It is video 42.